Welcome to English In A Minute. Give us a minute and we'll give you a hot tip about English. Grammar, vocabulary... there's so much to learn! And all taught by your favourite BBC Learning English staff! Do you have a minute to spare to learn some English? See Sian specify why been is not the same as gone! Give us 60 seconds and we'll give you the English! Hi, Sian here for BBC Learning English. And today, we're going to look at these two little words. 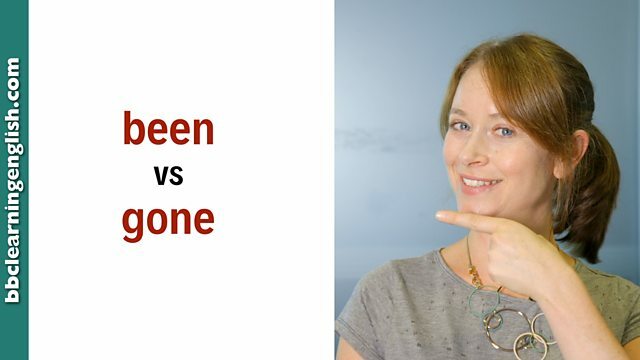 So been and gone are both past participles, both used with the present perfect, but they don't have the same meaning. We use been to talk about complete visits. So, she has been to Paris means that she visited Paris at some point in the past and now she's back in the UK. Careful with pronunciation. When we say been in a sentence, it becomes /bɪn/. She's been to Paris. But, she's gone to Paris means she travelled to Paris and she's still in Paris now. She's on holiday. She's gone to Paris. Easy, right? Been – you go somewhere and return. Gone – you go somewhere but don't return. Did you like that? Why not try these? Both been and gone are commonly used with the present perfect tense. This is formed with have/ has + a past participle verb. Been is used for complete visits. A person goes somewhere and returns. He hasn't been to India. Have they been to Rekyavik? Gone is used when someone goes somewhere and doesn't return. They left before and have not come back. We haven't gone very far. Don't worry. Have you gone to work already? I need a lift. Try our quiz to see how well you've learned today's language. Test your understanding of this lesson with our quiz! Does the verb look more like be or go? Which verb is 'been' the past participle of? If someone has gone, have they come back? 'I think he's gone to work.' What does this mean? If someone has been somewhere, have they returned? If I say 'I've just been to the shops', where am I? You can download a PDF document for this episode here. We hope you enjoyed English in a Minute. You can find more episodes here.